Background: Despite the confirmed favorable prognosis of childhood t(8;21) acute myeloid leukemia (AML), recent reports suggest heterogeneity in survival outcomes in this subtype of AML may be influenced by ethnicity. Therefore, we aimed to assess the outcome of childhood t(8;21) AML in an Arab population to evaluate if survival outcomes were inferior and determine the predictive relevance of additional cytogenetic abnormalities. Methods: This multicenter retrospective study analyzed 175 de novo AML children of 14 years of age or younger consecutively diagnosed between January 2005 and December 2012. Survival outcomes were analyzed and patients with t(8;21) were stratified on the basis of karyotype into sole and additional cytogenetic groups. Results: A total of 33 (18.9%) patients had t(8;21) AML. Complete remission (CR) was achieved in 31 (93.9%) patients. 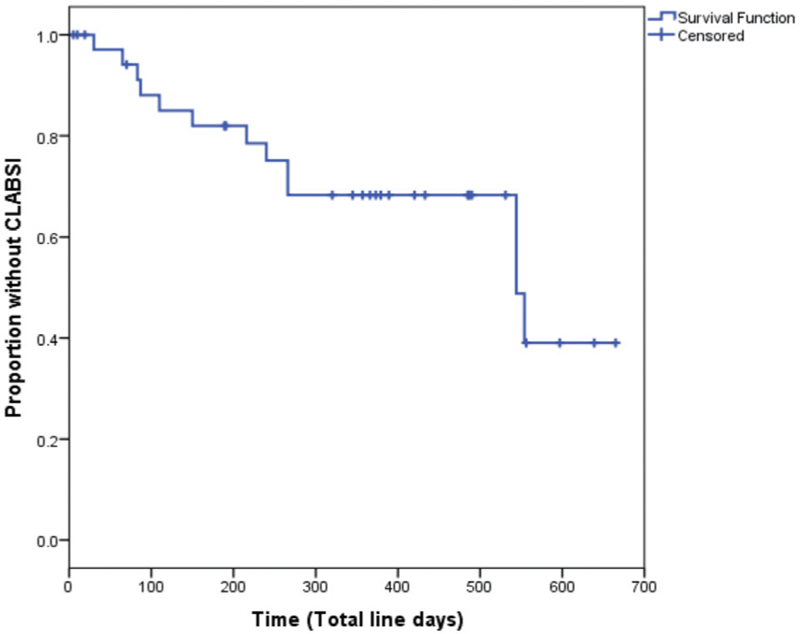 The 5-year overall survival, event-free survival, cumulative incidence of relapse (CIR), and remission death rates were 59.9 ± 9.2, 45.6 ± 9.1, 36.4, and 9.1%, respectively. Despite the administration of hematopoietic stem-cell-transplant salvage therapy in first relapse, five out of 11 (45.5%) relapsed patients died of disease. Subanalysis of sole vs. additional cytogenetic abnormalities revealed no significant difference in outcome. 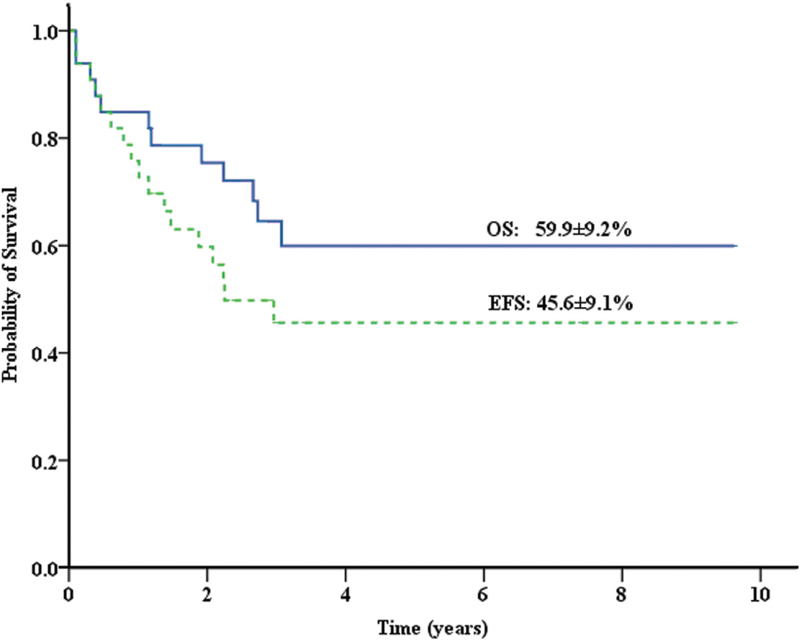 Conclusion: In the present study, childhood t(8;21) AML was associated with inferior survival and resistance to salvage therapy compared to reports from international groups. The inferior outcomes were unrelated to additional cytogenetic abnormalities. Further detailed genetic studies are warranted to unmask the biological and clinical differences between racial/ethnic groups. Given the high CR rate of childhood t(8;21) AML, further modification of postremission therapy to improve the CIR rate is needed. Objective: To assess the central line-associated bloodstream infection (CLABSI) rate and risk factors in hospitalized pediatric oncology patients in Qatar. Materials and Methods: A prospective, observational study was conducted in pediatric oncology department at Hamad Medical Corporation, Qatar between January 1, 2013 and December 31, 2014. All children <14 years of age with malignancy who required a central line catheter were included. Results: Thirty-seven subcutaneous tunneled catheters were inserted. Majority of the patients were younger than 10 years of age (88%), and the male-to-female ratio was 1.3:1. Leukemia was the most frequently encountered diagnosis. The overall mean central venous catheter (CVC) infection rate was 4.12 CLABSI per 1000 CVC days (95% confidence interval 2.41, 7.05). Thirteen catheters were infected (35.1%), of which 11 catheters were Porta-a-Cath, and two catheters were Hickman double lumen line. Gram-negative bacteria were found in 69.2% of the CLABSI cases, and no fungal infection was detected. Gender, age, type of disease, and type of catheter were not associated with increased risk for CLABSI (P > 0.05). 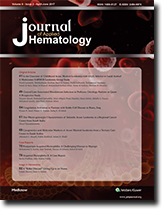 The mean number of days with neutropenia was more in the patients who had CLABSI 73.5 ± 44.5 compared to the patients who did not have CLABSI 48.9 ± 52.1, but the difference did not reach statistical significance (P = 0.140). Conclusion: The incidence rate of CLABSI continues to be a concern in hospitalized pediatric oncology patients in Qatar. This study showed that mean CVC infection rate was 4.12 CLABSI per 1000 CVC days. Gram-negative bacteria CLABSI were the dominant organism in this group of patients and catheters. Background: Sickle cell disease (SCD) is considered to be a hypercoagulable state that contributes to the morbidity associated with the disease. Numerous mechanisms can attribute to this hemostatic activation among these patients. Objectives: The study was designed to evaluate changes in hemostatic tests, coagulation inhibitors, fibrinolysis, and phosphatidylserine exposure on red blood cells (RBCs) among patients with SCD during both a vaso-occlusive crisis (VOC) and a steady state. Materials and Methods: This observational study comprised 61 patients with SCD, 2 to 16 years old, and 65 healthy patients. Thrombophilia evaluation included prothrombin time (PT), activated partial thromboplastin time (aPTT), protein C and S, d-dimer and Annexin V expression. The independent t test and one-way analysis of variance test were used for comparison of the mean of different samples. Results: During steady state, patients with SCD had longer PT (14.36 ± 0.98 and 13.32 ± 0.79 s), longer aPTT (31.48 ± 2.52 and 30.11 ± 2.04 s), lower protein C (90.95 ± 20.11 and 98.18 ± 18.42 U/L), lower protein S (60.18 ± 12.96 and 80.8 ± 12.67 U/L), and higher d-dimer (1.19 ± 1.25 and 0.27 ± 0.23 μg/mL) levels than the control group, respectively, P < 0.05. Furthermore, a longer PT (15.02 ± 2.11 s), lower protein C (69.21 ± 16.32 U/L), lower protein S (46.56 ± 9.47 U/L), and higher d-dimer levels (3.44 ± 2.62 μg/mL) were reported during VOC compared to steady state. 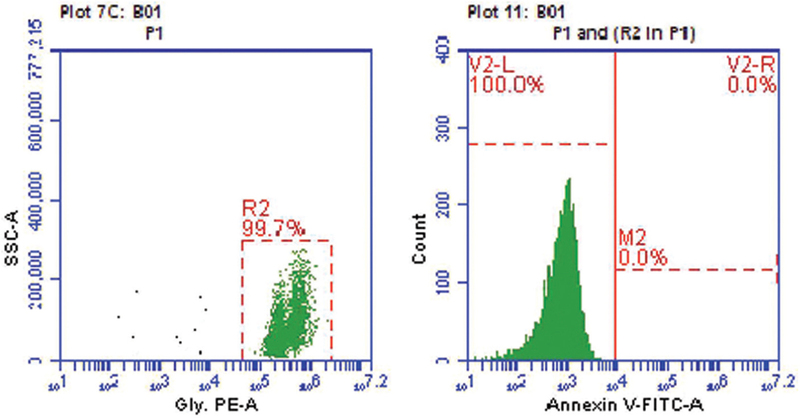 The mean percentage of RBCs expressing Annexin V was assessed in only 10 patients with SCD and eight in the control group. The mean percentage during a VOC (7.66 ± 3.63) was higher than that during steady state (1.57 ± 0.94) and in the control group (0.41 ± 0.15), P = 0.000. Pearson correlation revealed that d-dimer is significantly associated with hemoglobin, indirect bilirubin, and lactate dehydrogenase, P < 0.05. Conclusion: Patients with SCD, particularly during VOC, undergo significant hematologic alterations that increase their risk of developing coagulation activation-related complications. Introduction: Acute leukemia (AL) is uncommon in infants, with an annual incidence of 30 per million live births. They have peculiar biological characteristics. Although remarkable progress is seen in treatment of childhood AL, infantile AL remains a resistant subset with a dismally low 4-year survival of 35%. Objectives: To study the morphological, immunophenotypic, and cytogenetic features of infantile AL. A retrospective study of AL cases in children from birth up to 1 year of age, presenting to the departments of pediatric oncology and hematopathology between January 2010 and April 2015, was conducted. Results: Thirty-eight cases of infantile AL were included. The mean age at presentation was 10.2 months, and a female preponderance (M–F ratio: 0.65:1) was noted. 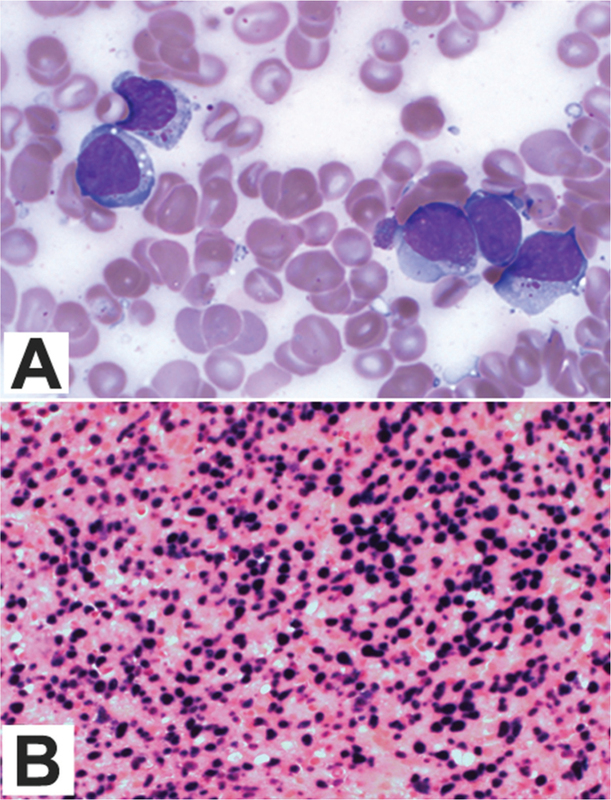 Hyperleukocytosis (total white cell count >50 × 109/mm3) was seen in 13 (39.4%) cases. Immunophenotyping done in 31 cases showed pre-B acute lymphoblastic leukemia (B ALL) in 18 (58%), pre-T ALL in three (9.7%), and acute myeloid leukemia (AML) in 10 (32.3%). CD10 positivity was seen in 12 (57.1%) cases of ALL. 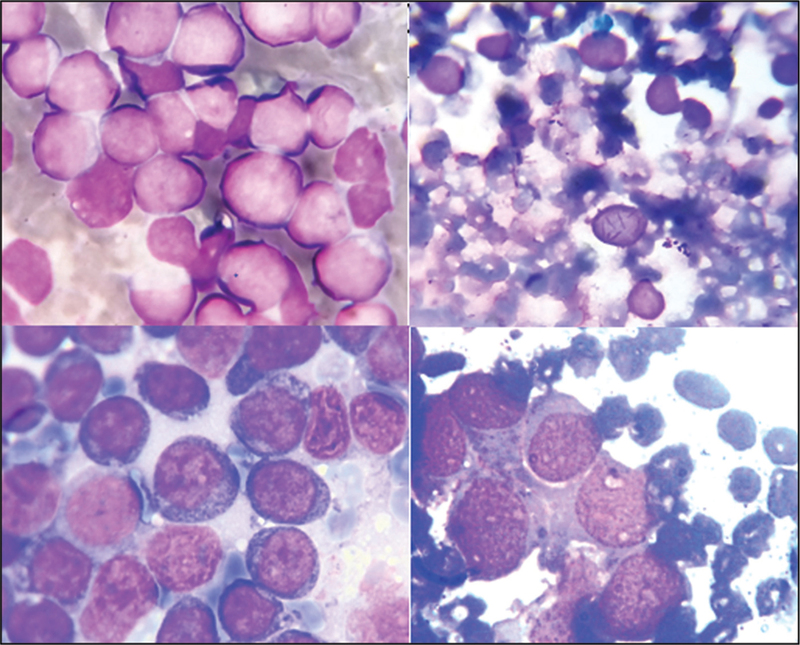 Cytogenetic study done in 34 cases showed AML with recurrent genetic abnormalities in four. Mixed lineage leukemia (11q23) abnormality was seen in three cases of ALL. Two cases of AML were associated with trisomy 21. One case with features of AML M7 in a 4-day-old baby turned out to be transient abnormal myelopoiesis on follow-up. Conclusion: Literature on infantile AL from Indian studies is scarce compared to the available Western literature. Hence an epidemiological study of AL cases was done with review of literature, in an attempt to understand their pheno-genotypic features that influence their behavior. This may help in standardizing the treatment of these rare cases. Background/Purpose: Acute myeloid leukemia (AML) is a phenotypically and genetically heterogeneous disease. This heterogeneity is attributed to alterations in genetic bases. AML classification based on these abnormalities is essential for accurate diagnosis, risk stratification, prognostic value, monitoring of minimal residual disease, and developing targeted therapies. This study evaluates frequency of each karyotype and molecular abnormality at our institution with comparison to other international studies. Materials and Methods: We reviewed 100 bone marrow samples, which represent all AML diagnosed cases at our hospital from 2012 to 2014 by conventional karyotyping, specific AML–FISH panel, and variety of AML-specific mutations using Sanger sequencing. 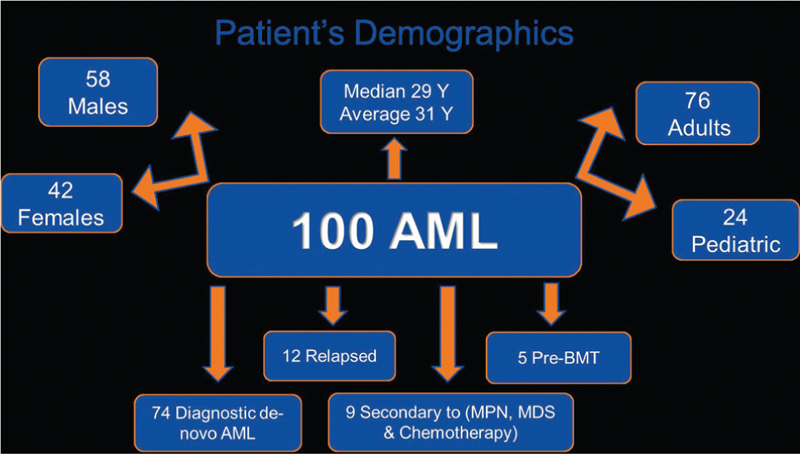 Results: Out of 100 AML patients investigated with median age of 29 years, 98 were successfully karyotyped, and 64% of cases had an abnormality. In addition, all 100 AML–FISH panel and molecular studies were informative with an abnormality reaching 50 and 45%, respectively. Conventional and molecular cytogenetic studies revealed trisomy 8 (15%), t(8;21) in 12%, trisomy 21(8%), inv(16) in 7%, t(15;17) in 6%, 11q rearrangements (6%), and inv(3) in 2%. The mutational analysis showed nucleophosmin 1 (12%), FMS-like tyrosine kinase-3–internal tandem duplication (9%), IDH2 (7%), IDH1 (6%), WT1 (5%), DNMT3A (4%), CEBPA (4%), and c-KIT (3%). Conclusion: The incidence of most mutational analysis is lower, whereas abnormal karyotype showed almost similar frequency when compared to different international centers. This is the first cytogenetic data from Saudi Arabia for AML, including all these genetic mutations. Therefore, a multicenter collaboration and comprehensive study is recommended to confirm these findings. Acquired hemophilia is a severe bleeding diathesis that affects both males and females. It is caused by suddenly appearing autoantibodies that interfere with the coagulation factor VIII activity. This disorder is characterized by spontaneous and post-traumatic subcutaneous bleeds and massive mucosal hemorrhages. We report a case of postpartum-acquired hemophilia with a compartment syndrome of right (Rt.) forearm in a 29-year-old woman. Hemostatic tests indicated a prolonged activated partial thromboplastin time (APTT) to 99 s (normal 30.4–40 s), the prothrombin time was 7.8 s (normal 12–14 s), and the platelet count was 271,000 (normal 155,000–450,000). Further workup demonstrated the presence of autoantibody against factor VIII in a titer of 15 Bethesda Units/ml (BU/ml) and a decreased factor VIII activity to 0.04 IU/ml (normal 0.6–1.5 IU/ml). 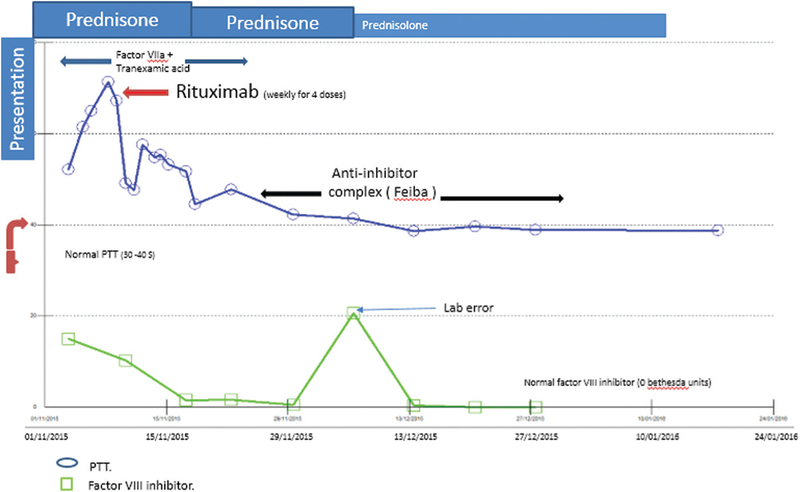 Immunosuppressive treatment with oral prednisone at 60 mg/24 h was initiated, but she was refractory to steroids; therefore, rituximab was added on a weekly basis for 4 weeks. At the same time, factor eight inhibitor bypassing activity (FEIBA), an anti-inhibitor coagulant complex, has been used as a bypassing agent. Reduction of the factor VIII inhibitor titer to 0 BU/ml and an increase of factor VIII activity to 0.38 were achieved. This led to normalization of hemostatic parameters (APTT 38.9 s, factor VIII activity 0.38). Acquired hemophilia A is a rare autoimmune disorder where autoantibodies are produced against factor VIII. Its reported incidence is as low as 1.20 to 1.48 cases per million per years. However, this entity is underreported because diagnosis is often missed in routine practice as its symptoms differ from its congenital counterpart. We report a 25-year-old male who presented with proptosis of left eye and gastric outlet obstruction. Routine workup revealed isolated elevation of activated platelet thromboplastin time. The patient, however, did not have any history of bleeding episodes, and family history was also negative. Mixing studies and inhibitor screening revealed presence of inhibitors. High degree of clinical suspicion is required to correctly diagnose this rare entity presenting with variable bleeding manifestations. A 33-year old female presenting with hepatosplenomegaly and pancytopenia showed atypical lymphoid cells in peripheral blood and bone marrow. Immunophenotyping confirmed the diagnosis of Aggressive NK-cell leukemia. Despite treatment by chemotherapy and targeted therapy she deteriorated and died only 7 months after diagnosis.